Here a simple circuit to control the Water pumps. When the water level in the over head tank exceeds the required level, the pump automatically turns off and stops the pumping process thus preventing the over flow of water. It uses a relay to cut off the power supply to the water pump. CMOS IC CD4001: It is a versatile 14 pin IC which contains 4 NOR gates. Each NOR gate has two inputs and one output. Thus the IC has 8 input pins and 4 output pins, one Vcc pin (connected to positive voltage supply) and one Vss (connected to negative supply). Its basic features include – Maximum supply voltage: 15V, Minimum supply voltage: 3V, Maximum speed of operation: 4MHz. It can be used in tone generators, metal detectors etc. 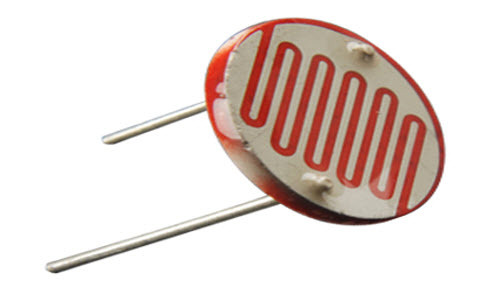 Transistor BC547: It is a NPN bipolar junction transistor and it is used mainly for amplification and switching purpose. Its features include maximum current gain of 800.It is used in CE configuration when used as an amplifier. Battery: A DC supply of 9V is given through a battery to power up the circuit. The circuit uses a CMOS IC CD 4001 / 4011 to drive the relay. Its input gate 1 is used to connect the probe to detect the water level. One probe is connected to the gate 1 of the IC and the other probe to the ground. When the probe A connected to the gate 1 of IC is floating, the input of gate 1 remains high and the output pin 4 goes high and the relay driver transistor conducts. The relay will be activated. The power supply of the water pump is connected through the common and the NO contacts of the relay so that when the relay turns on, water pump works. 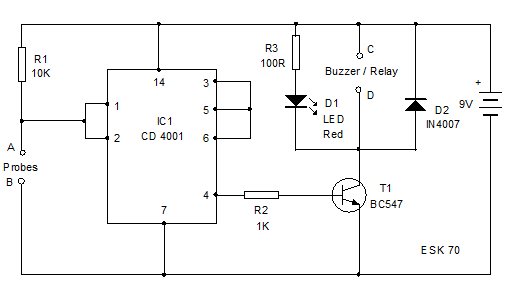 LED indicates the working of the relay. When the water level rises and makes contact with the probes A and B, output of IC turns low and the relay de-energizes to stop the pumping. Initially when A and B are not connected, i.e. water level is low, the input pin1 of the IC is at logic high and according to NOR gate truth table, the output at pin3 will be at logic low. Since pin3 is shorted to pins 5 and 6, hence the input to other NOR gate will be logic low signals. This gives a logic high signal to the corresponding output pin 4. As current flows through the resistor to the base of transistor, it starts conducting and acts as a closed switch. The relay connected to the collector of the transistor gets energized and the NO contacts get connected to the common contact and the water pump gets power supply from the mains and starts working. Now when water level rises in the tank rises such that probes A and B are connected through water, current flows through them (As water is a conductor) and the pins 1 and 2 are connected through A and B to the negative supply of the battery. The output pin3 is thus, at logic high level, causing the input pins of the other NOR gate to be at logic high level and thus the corresponding output pin4 is at logic low level. The transistor gets cutoff due to lack of bias current and the relay gets correspondingly de-energized and the power supply to the water tank gets cut off. Apart from the technique discussed above, there can be another way to control water level in the tank by sensing it using Ultrasonic technique. Unlike the previous method, this does not requires any contact with the water tank. A Regulated DC power supply to convert the AC supply to regulated DC voltage using bridge rectifiers and filters. An ultrasonic Module consisting of an ultrasonic transmitter and a receiver to sense the water level condition of the tank. 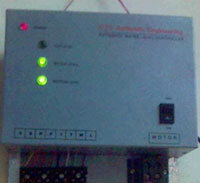 A microcontroller which acts as a control unit. The ultrasonic sensor senses the level of water in the tank by transmitting ultrasonic signals towards the tank. The water in the tank reflects back the ultrasonic signals, which are received by the receiver. The ultrasonic or the sound signal received is converted to electric signal pulses which are applied to the Microcontroller. These pulses denote the level of water in the tank. As the water level decreases below certain level, the ultrasonic module gives an indication through the electric signal and the Microcontroller accordingly drives the transistor to off condition, which in turn causes the MOSFET to be switched on and accordingly the relay gets energized and the pump is switched on. In case the water level is above the threshold level, the Microcontroller accordingly switches off the relay through the transistor and MOSFET arrangement, so as to switch off the pump. This system is used only to sense the level of water in a tank and display the reading on a 7 segment display. Here a circuit board consisting of a parallel arrangement of conducting wires is placed in the tank. These wires serve as input to the Priority Encoder which generates a BCD output based on the input readings. The Priority Encoder drives a set of transistors which in turn provide input to the BCD to 7 segments Decoder which uses the BCD signal to drive the 7 segment LED display. When the input unit is placed in the water tank, current flows through the wires immersed in water and accordingly the corresponding number of inputs is in high logic state. The Encoder receives this input and based on the priority level of the inputs, gives a digital output code corresponding to the input with highest priority. Thus if current flows through all the wires, i.e. the tank is full; the output code will correspond to the highest level. Here the input unit or the scale is divided into 10 levels from 0 to 9. 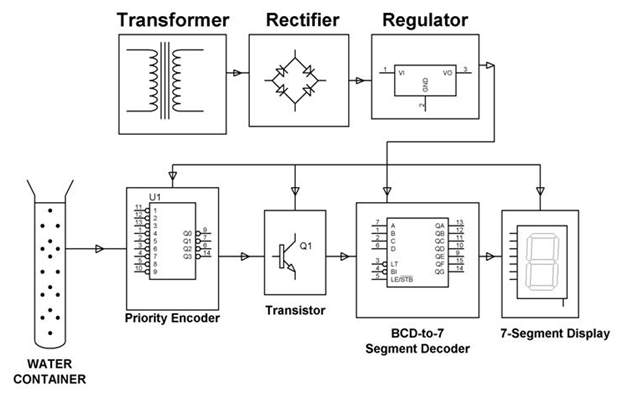 Incase all the inputs to the Encoder are in high state, the output is also a high logic signal which drives all the transistors to ON condition, so that all the inputs to the BCD to 7 segment Decoder are in low logic state. 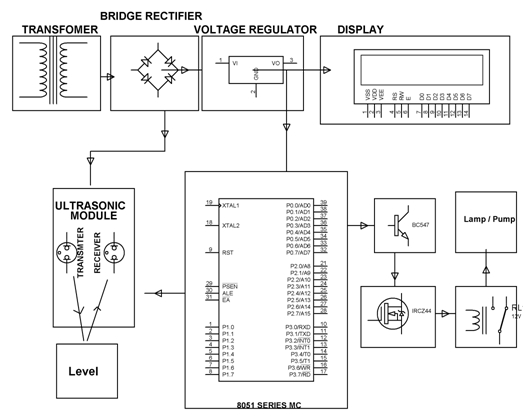 The BCD to 7 segment Decoder simply acts as an inverter and thus gives a high logic signal in all its output and thus the highest level of 9 is displayed on the Display. This is a student level project not for the commercial purpose. If you want the complete information please email your requirements to team@delprocus.com and our technical team will help you. You can ask any questions here or you can mail all your questions to team@elprocus.com and our technical team will help you. your content is awesome it helped me to make this project thanks for sharing it. As per your query please email all your requirements to team@elprocus.com and our technical team will help you. Hi Kamlesh, Thank you for your feedback. Please check the link for more latest project ideas. I do not know anything in electronic circuits. And I liked the idea of water level indicator. 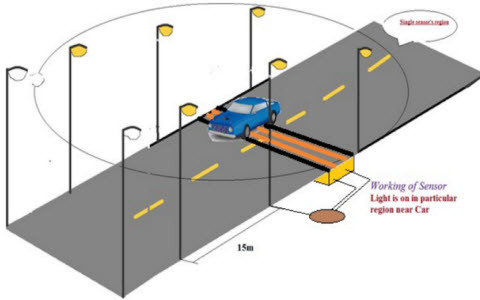 But, if possible, be sensitive to wireless measurement and control of the water level on the engine. Want the map and the map PCB due. Business venture. Understanding how the subject and with wages and Thanks. Please check your mail we have sent you the details to your mail id rak2aju88@gmail.com. can i get some ug projects- theft prevention in jewellery shop using sensor network………..
We had sent you the details to your mail id sharlyiswarya7@gmail.com please check it. Thank you for your feedback. Please check the links below for embedded project ideas. i am a student of b.tech 7th sem (ece). i am doing my training in airtel company in jammu but i want to do a mini project at home. Please follow this link for list of mini projects.